Yorkshire Laser and Fabrication is a byword for experience and expertise in sheet metal fabrication. We combine experience with innovation to ensure we can design and deliver the most up to date, reliable and sustainable solutions. 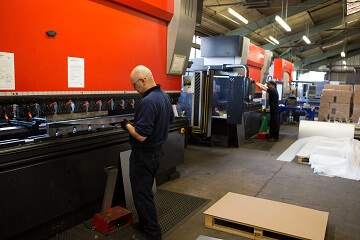 Harnessing the benefits of modern technology, we are the ‘go to’ experts in sheet metal laser fabrication, laser profiling, CNC punching, and CNC folding. Plus, Yorkshire Laser offers a complete offline design service using the latest 3D modelling software package from Solid Works. Whether it is a mild steel, stainless steel or aluminium enclosure, we can create any size, shape or complexity that you require, and we can supply them complete with hinges, handles, locks, seals as well as a variety of internal and external painted finishes. In short, we specialise in delivering finished sheet metal enclosures in all shapes and sizes ready for you to install your components. We can work with you to ensure that the sheet metal fabrication you require is made to suit your specifications exactly, saving you time and money.